0% Introductory APR for first 12 months on purchases and balance transfers. Your APR will be between 10.15% and 19.15%. This APR will vary with the market based on the Prime Rate. The pricing you receive will be determined upon review of your application, credit history, and banking relationship. 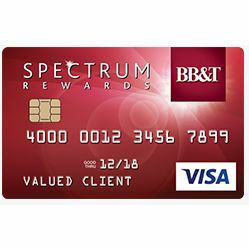 For e-mail, log on to your BB&T Online Banking account. To find the nearest BB&T branch's mailing address, enter your zip code here.